A collection of the last remaining unpublished and uncollected short stories by F. Scott Fitzgerald, the iconic American writer of The Great Gatsby who is more widely read today than ever. “A treasure trove of tales too dark for the magazines of the 1930s. Lucky us” (Newsday). “His best readers will find much to enjoy” (The New York Times Book Review). I’d Die For You, edited by Anne Margaret Daniel, is a collection of F. Scott Fitzgerald’s stories never widely shared. Some were submitted individually to major magazines during the 1930s and accepted for publication during Fitzgerald’s lifetime, but never printed. Some were written as movie scenarios and sent to studios or producers, but not filmed. Others are stories that could not be sold because their subject matter or style departed from what editors expected of Fitzgerald. Some of the eighteen stories were physically lost, coming to light only in the past few years. All were lost, in one sense or another: lost in the painful shuffle of the difficulties of Fitzgerald’s life in the middle 1930s; lost to readers because contemporary editors did not understand or accept what he was trying to write; lost because archives are like that. Readers will experience here Fitzgerald writing about controversial topics, depicting young men and women who actually spoke and thought more as young men and women did, without censorship. Rather than permit changes and sanitizing by his contemporary editors, Fitzgerald preferred to let his work remain unpublished, even at a time when he was in great need of money and review attention. Written in his characteristically beautiful, sharp, and surprising language, exploring themes both familiar and fresh, these stories provide new insight into the bold and uncompromising arc of Fitzgerald’s career. 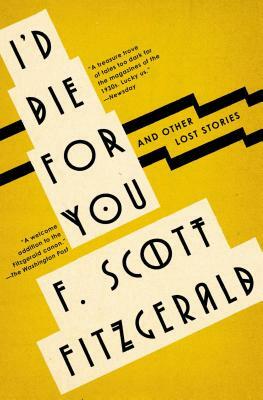 I’d Die For You is a revealing, intimate look at Fitzgerald’s creative process that shows him to be a writer working at the fore of modern literature—in all its developing complexities. Anne Margaret Daniel teaches literature at the New School University in New York City. She has published widely on Fitzgerald and on Modernism since 1996. Anne Margaret lives in Manhattan and in upstate New York. "A treasure trove for Fitzgerald enthusiasts, scholars, and aspiring writers… an invaluable glimpse into a brilliant but struggling writer's process." "His best writing is grounded in a specific time and place, and then propelled by his deep emotional attachment to the subject matter... shows curious readers how the author tried to mine an idea... editor Anne Margaret Daniel’s individual story introductions are highly informative, and her extensive annotations are illuminating." "No English-language author ever wrote a more musical sentence than Fitzgerald, a stunning accomplishment considering his work’s diamond-like clarity... few can doubt the greatness of what he did write in his hectic, too-short life." "How pleasurable to be borne back ceaselessly into the past... The material in this collection trades in mature topics... Fitzgerald’s precision and fineness, even at the depth of his powers, exceeds contemporary writers by miles." "For F. Scott Fitzgerald fans wanting a thrill that readers of his time were denied... Part of the charm of this anthology is that the stories appear without the censorship to which they might have been subjected." "Many of the stories remained unpublished because Fitzgerald reached a point in his career when he refused to allow his work to be edited by the magazines that might have bought them. Now, here they are — a welcomed addition to the Fitzgerald canon."